Time brings change. Health care is different than what it used to be decades ago. While we now have access to new technology and research to better our care methods, health care today also emphasizes family-centered, patient-focused care. Visiting standards at the OSF HealthCare Children’s Hospital of Illinois Neonatal Intensive Care Unit (NICU) are not exempt from change over time. Visitors are now allowed more access to the NICU than ever before. 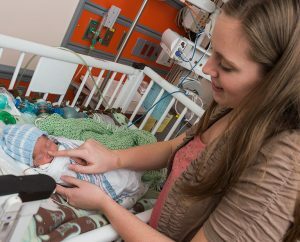 Discover how our NICU families now play a vital role in the care of our little patients. 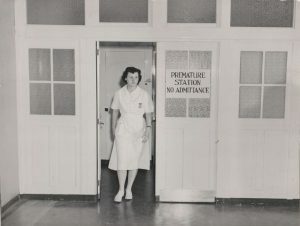 A nurse leaves the Premature Station in the 1940s. The unit was completely closed to visitors. In 1942, before more advanced technologies became available, care focused on keeping infants fed, warm and free of infection. Access to the nursery was limited to nursing staff only, with doctors only seeing infants at admission and at discharge. Parents were not allowed to visit. Often, their first contact with their baby was when the baby was discharged from the hospital. By 1962, parent visiting was allowed from 1-3 p.m. on Sundays only, and no siblings were allowed to visit. By the 1970s, visiting was open on an extended schedule to parents only. Before entering the unit, parents were required to wear yellow gowns to cover their clothing and scrub, which is when visitors wash from their elbows to fingertips with a special soap to reduce the risk of infection. By the 1980s, grandparents were allowed to visit. When doctors would make their rounds to each patient, all family members were asked to step out of the room. It wasn’t until the mid-1980s that siblings were allowed in the NICU on a limited basis. Nurses wore hospital-provided scrubs and put on yellow gowns when exiting the unit to protect their clothing from outside germs. By the 1990s, yellow gowns were no longer required. But anyone entering the unit was still required to scrub. A mother spends time with her premature infant in the NICU in 2017. Parents are encouraged to be active in their babies’ care. The new millennium brought more focus on family-centered care, which meant more family involvement. Parents were encouraged to visit and be active in their baby’s care. They were also included in doctor rounds. Due to space constraints, only two people were allowed at each infant’s bedside. Families were asked to leave the unit at the nurse’s shift change. In 2010, the construction of the new OSF HealthCare Children’s Hospital of Illinois was completed. With the new building, came considerable changes to the visiting policy. The NICU is a 64-bed unit with 24-hour visiting. Each baby has their own room, making it more convenient and private for families to stay with their babies around-the-clock. Parents are able to designate two care partners who are allowed to visit without the parents being present. Parents are also allowed to have a limitless list of visitors. Now, four people can visit at one time. While challenging at times, open visiting has allowed for a more family-friendly experience. Parents know that even if they can’t be present, a care partner can be with their infant. Throughout our NICU history, the baby has always been our top priority. Experience and changing visiting policies has shown that parent and family involvement is a crucial part of our patients’ overall care.